Need A Root Canal But Don't Have Dental Insurance? No Dental Insurance But Need a Root Canal? Has your dentist recommended you get a root canal because of an infected or decaying tooth? 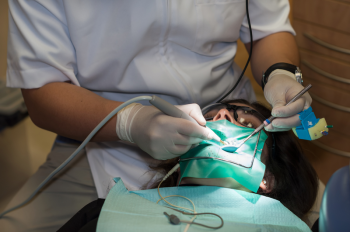 The idea of such treatment may be frightening—although there’s really nothing to worry about—but even more frightening than that might be how you’re going to pay for it with no dental insurance? In this article, we’ll go through what a root canal is, why you would need to get one and how you can pay for it. How Much Does it Cost to Get a Root Canal? A root canal itself costs between $900 and $1,600 with no insurance. Below is a list of average prices for the different types of root canals. Keep in mind there may be additional costs associated with a root canal procedure. You experience tooth sensitivity with hot or cold temperatures even after what has caused the heat or cold has been removed. Your teeth begin to discolor or darken. You have a severe toothache when you chew or apply pressure. Your gums swell and become tender. You have recurring and persistent pimples on your gums. While there is really only one type of root canal—although it varies depending on the location of the tooth—there are several preventative techniques associated with endodontics because it aims to prevent decay and infection from reaching the pulp of the tooth. Here are some of those preventative methods, along with a more thorough explanation of the root canal process. Pulp Capping: This is a preventative technique that comes before a root canal. It is used to stop tooth decay from attacking the pulp chamber of the tooth. However, if the pulp has already been infected and the tooth dies, a root canal will be needed. Therapeutic Pulpotomy: Another preventative technique, therapeutic pulpotomy is typically performed on primary teeth to stop decay from reaching the tooth’s pulp. Endodontic Therapy: Also known as root canal therapy, endodontic therapy treats the inside of an infected tooth by removing the infected pulp, cleaning the inside of the tooth and then filling and sealing it with a rubber-like material. Then, a crown is placed over the tooth for protection. For those of you wanting to save money on root canals, consider discount dental plans. They’ll help cut the cost of a root canal and other dental procedures to make them more affordable for you.